If you were happy to see the multi-language experience introduced by CRM 4.0, with as many as 41 language packs available, you are going to LOVE this feature. This not-so-obvious feature, now available as part of the beta release of Microsoft Dynamics CRM 2011, is the ability to host organizations of different base languages under the same deployment. Yes. In Dynamics CRM 4.0, the language of your server installation determined the base language of all the organizations that you could create on that deployment. Now, in Microsoft Dynamics CRM 2011, only the language of the first organization is tied to the language of the server installation, but all subsequent organizations created in that same deployment can have different base languages, provided the corresponding language packs are installed in that given deployment. 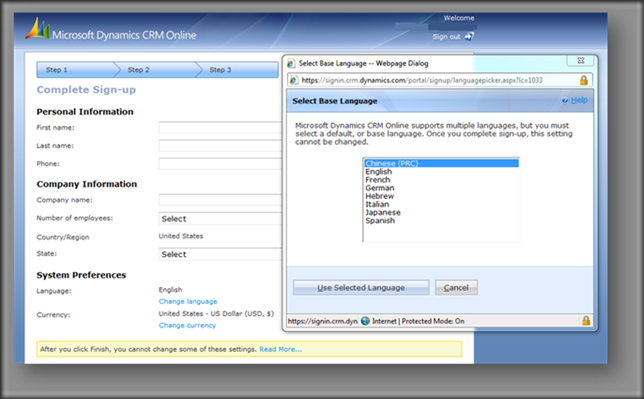 For example, even though the server components of the beta release of Microsoft Dynamics CRM 2011 are only available in English, you can create organizations with base languages being any of the following: English, French, German, Hebrew, Italian, Japanese, Spanish and Simplified Chinese. This also means that, when the final product is ready, you will be able to create organizations in any of the 41 languages that will be available, and that is regardless of the language of your server installation.